Declining trees are a common sight in the urban environment. 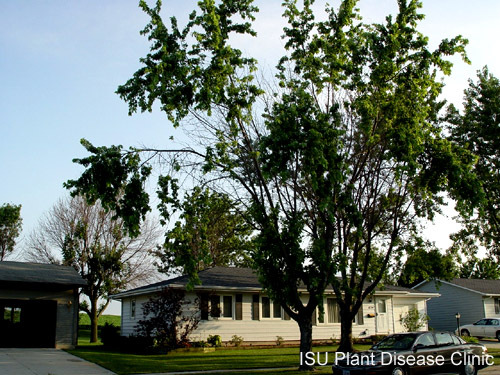 A gradual decline in health is a common problem for many trees in urban and rural areas across Iowa. Symptoms may include stunted growth, premature leaf drop, late spring leaf developments, sparse foliage, light green or yellow foliage, twig and branch die-back, or many other abnormal symptoms. Usually, there is no single reason for tree decline. Often, a combination of factors reduces a tree's vigor, and stress on a tree can make it vulnerable to additional problems. Disease and insects often capitalize on the tree's low vigor and accelerate its decline. For information on tree decline please see handout Understanding Decline in Trees" from Iowa State University Extension. The foliage on my bleeding heart dies back in early summer. What is wrong? My green ash trees have been dropping leaves this spring. Why?